As is well known, the Social Security Trust Fund will run out in about 2034 (plus or minus a year) if nothing is done. “Running out” means that the past accumulated stock of funds paid in through Social Security taxes on wages, plus what is paid in each year, will not suffice to cover what is due to be paid out that year to beneficiaries. If nothing is done, Social Security payments would then be scaled back by 23% (in 2034, rising to 27% by 2091), to match the amount then being paid in each year. This would be a disaster. Social Security does not pay out all that much: An average of just $15,637 annually per beneficiary for those in retirement and their survivors, and an average of just $12,452 per beneficiary for those on disability (all as of August 2017). But despite such limited amounts, Social Security accounts for almost two-thirds (63%) of the incomes of beneficiaries age 65 or older, and 90% or more of the incomes of fully one-third of them. Scaling back such already low payments, when so many Americans depend so much on the program, should be unthinkable. Yet Congress has been unwilling to act, even though the upcoming crisis (if nothing is done) has been forecast for some time. Furthermore, the longer we wait, the more severe the measures that will then be necessary to fix the problem. It should be noted that the crisis is not on account of an aging population (one has pretty much known for 64 years how many Americans would be reaching age 65 now), nor because of a surprising jump in life expectancies (indeed, life expectancies have turned out to be lower than what had been forecast). Rather, as discussed in an earlier post on this blog, the crisis has arisen primarily because wage income inequality has grown sharply (and unexpectedly) since around 1980, and this has pulled an increasing share of wages into the untaxed range above the ceiling for annual earnings subject to Social Security tax ($127,200 currently). But Congress could act, and there are many different approaches that could be taken to ensure the Social Security Trust Fund remains adequately funded. This post will discuss just one. And that would be not to approve the Trump proposal for what he accurately calls would be a huge cut in taxes, and use the revenues that would be lost under his tax plan instead to shore up the Social Security Trust Fund. As the chart at the top of this post shows (and as will be discussed below), this would more than suffice to ensure the Trust Fund would remain in surplus for the foreseeable future. There would then be no need to consider slashing Social Security benefits in 2034. The Trump tax plan was submitted to Congress on September 27. It is actually inaccurate to call it simply the Trump tax plan as it was worked out over many months of discussions between Trump and his chief economic aides on one side, and the senior Republican leadership in both the Senate and the Congress on the other side, including the chairs of the tax-writing committees. This was the so-called “Gang of Six”, who jointly released the plan on September 27, with the full endorsement of all. But for simplicity, I will continue to call it the Trump tax plan. The tax plan would sharply reduce government revenues. The Tax Policy Center (TPC), a respected bipartisan nonprofit, has provided the most careful forecast of the revenue losses yet released. They estimated that the plan would reduce government revenues by $2.4 trillion between 2018 and 2027, with this rising to a $3.2 trillion loss between 2028 and 2037. The lost revenue would come to 0.9% of GDP for the 2018 to 2027 period, and 0.8% of GDP for the 2028 to 2037 period (some of the tax losses under the Trump plan are front-loaded), based on the GDP forecasts of the Social Security Trustees 2017 Annual Report (discussed below). While less than 1% of GDP might not sound like much, such a revenue loss would be significant. As we will see, it would suffice to ensure the Social Security Trust Fund would remain fully funded. The chart at the top of this post shows what could be done. The curve in green is the base case where nothing is done to shore up the Trust Fund. It shows what the total stock of funds in the Social Security Trust Fund have been (since 1980) and would amount to, as a share of GDP, if full beneficiary payments would continue as per current law. Note that I have included here the trust funds for both Old-Age and Survivors Insurance (OASI) and for Disability Insurance (DI). While technically separate, they are often combined (and then referred to as OASDI). The figures are calculated from the forecasts released in the most recent (July 2017) mandated regular annual report of the Board of Trustees of the Social Security system. Their current forecast is that the Trust Fund would run out by around 2034, as seen in the chart. But suppose that instead of enacting the Trump tax plan proposals, Congress decided to dedicate to the Social Security Trust Funds (OASDI) the revenues that would be lost as a consequence of those tax cuts? The curve in the chart shown in red is a forecast of what those tax revenue losses would be each year, as a share of GDP. These are the Tax Policy Center estimates, although extrapolated. The TPC forecasts as published showed the estimated year-by-year losses over the first ten years (2018 to 2027), but then only for the sum of the losses over the next ten years (2028 to 2037). I assumed a constant rate of growth from the estimate for 2027 sufficient to generate the TPC sum for 2028 to 2037, which worked out to a bit over 6.1%. I then assumed the revenue losses would continue to grow at this rate for the remainder of the forecast period. Note this 6.1% growth is a nominal rate of growth, reflecting both inflation and real growth. The long-run forecasts in the Social Security Trustees report were for real GDP to grow at a rate of 2.1 or 2.2%, and inflation (in terms of the GDP price index) to grow at also 2.2%, leading to growth in nominal GDP of 4.3 or 4.4%. Thus the forecast tax revenue losses under the Trump plan would slowly climb over time as a share of GDP, reaching 2% of GDP by about 2090. This is as one would expect for this tax plan, as the proposals would reduce progressivity in the tax system. As I noted before on this blog and will discuss further below, most of the benefits under the Trump tax plan would accrue to those with higher incomes. However, one should also note that the very long-term forecasts for the outer years should not be taken too seriously. While the trends are of interest, the specifics will almost certainly be different. 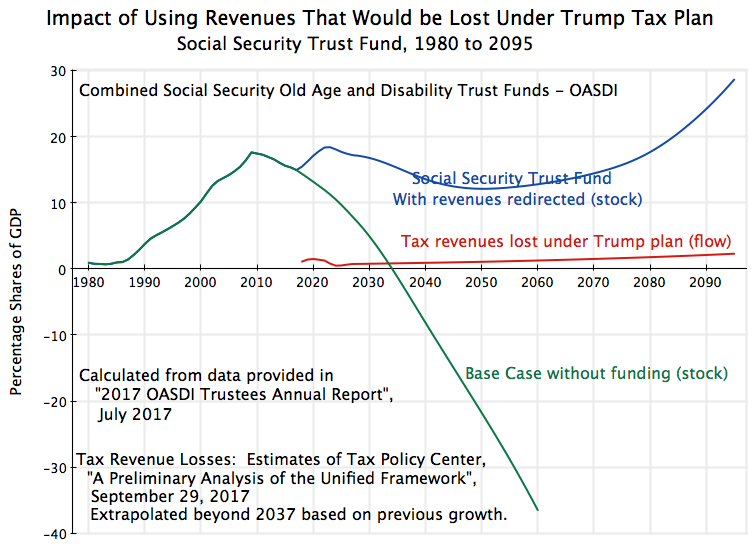 If the tax revenues that would be lost under the Trump tax plan were instead used to shore up the Social Security Trust Fund, one would get the curve shown in blue (which includes the interest earned on the balance in the Fund, at the interest rates forecast in the Trustees report). The balance in the fund would remain positive, never dipping below 12% of GDP, and then start to rise as a share of GDP. Even if the TPC forecasts of the revenues that would be lost under the Trump plan are somewhat off (or if Congress makes changes which will reduce somewhat the tax losses), there is some margin here. The forecast is robust. The estimate is that 87% of the tax revenues lost under the Trump plan would go to the richest 20% of the population (those households with an income of $154,900 or more in 2027, in prices of 2017). 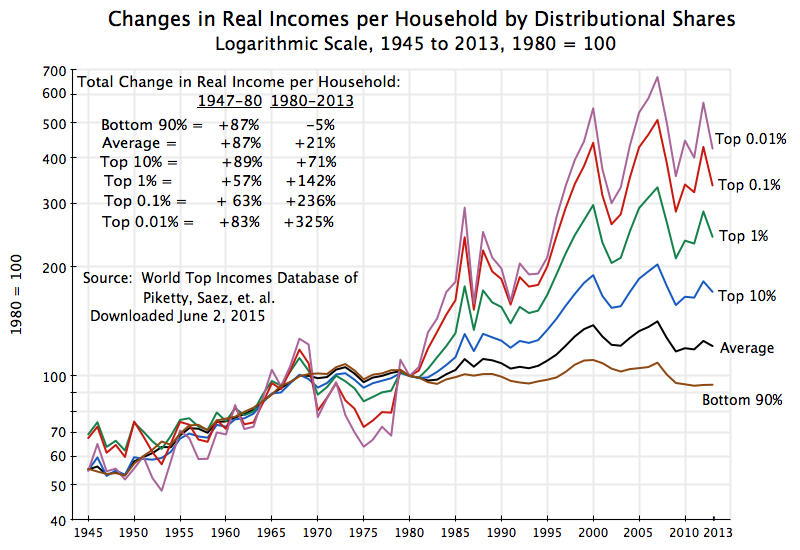 And indeed, almost all of this (80% of the overall total) would accrue just to the top 1%. The top 1% are already pretty well off, and it is not clear why tax cuts focused on them would spur greater effort on their part or greater growth. The top 1% are those households who would have an annual income of at least $912,100 in 2027, in prices of 2017. Most of them would be making more than a million annually. The Trump people, not surprisingly, do not accept this. They assert that the tax cuts will spur such a rapid acceleration in growth that tax revenues will not in fact be lost. Most economists do not agree. As discussed in earlier posts on this blog, the historical evidence does not support the Trumpian view (the tax cuts under Reagan and Bush II did not lead to any such acceleration in growth; what they did do is reduce tax revenues); the argument that tax cuts will lead to more rapid growth is also conceptually confused and reveals a misunderstanding of basic economics; and with the economy having already reached full employment during the Obama years, there is little basis for the assertion that the economy will now be able to grow at even 3% a year on average (over a mulit-year period) much less something significantly faster. Tax cuts have in the past led to cuts in tax revenues collected, not to increases, and there is no reason to believe this time will be different. Thus Congress faces a choice. 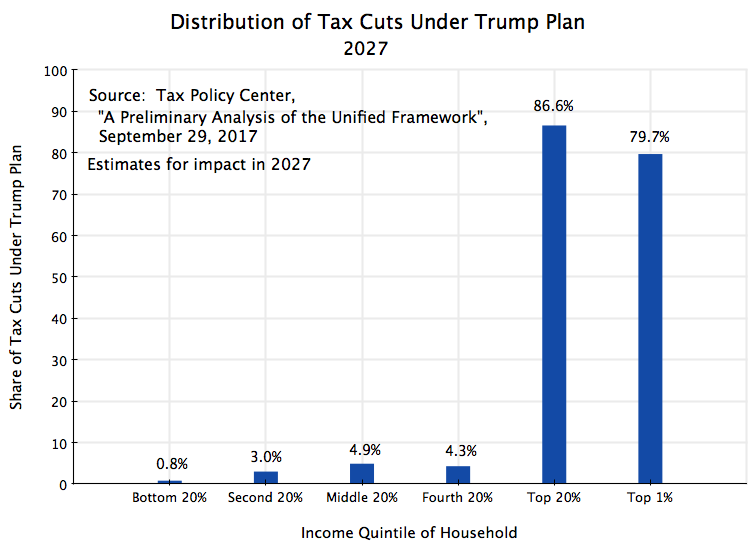 It can approve the Trump tax plan (already endorsed by the Republican leadership in both chambers), with 80% of the cuts going to the richest 1%. Or it could use those revenues to shore up the Social Security Trust Fund. If the latter is done, the Trust Fund would not run out in 2034, and Social Security would be able to continue to pay amounts owed to retired senior citizens and their survivors, as well as to the disabled, in accordance with the commitments it has made. I would favor the latter. If you agree, please call or write your Senator and Member of Congress, and encourage others to do so as well. The US Senate passed on October 19 a budget framework for the FY2018-27 period which would allow for $1.5 trillion in lost tax revenues over this period, and a corresponding increase in the deficit, as a consequence of new tax legislation. It was almost fully a party line vote (all Democrats voted against it, while all Republicans other than Senator Rand Paul voted in favor). Importantly, this vote cleared the way (under Senate rules) for it to pass a new tax law with losses of up to $1.5 trillion over the decade, and pass this with only Republican votes. Only 50 votes in favor will be required (with Vice President Pence providing a tie-breaking vote if needed). Democrats can be ignored. The loss in tax revenues in this budget framework is somewhat less than the $2.4 trillion that the Tax Policy Center estimates would follow in the first decade under the Trump tax plan. But it is still sizeable, and it is of interest to see what this lesser amount would achieve if redirected to the Social Security Trust Fund instead of being used for tax cuts. The chart above shows what would follow. It still turns out that the Social Security Trust Fund would be saved from insolvency, although just barely this time. One has to make an assumption as to what would happen to tax revenues after 2027, as well as for what the time pattern would be for the $1.5 trillion in losses over the ten years from FY2018 to 27. With nothing else available, I assumed that the losses would grow over time at the same rate as what is implied in the Tax Policy Center estimates for the losses in the second decade of the Trump tax plan as compared to the losses in the final year of the first decade. As discussed above, these estimates implied a nominal rate of growth of 6.1% a year. I assumed the same rate of growth here, including for the year to year growth in the first decade (summing over that decade to $1.5 trillion). The result again is that the Social Security Trust Fund would remain solvent for the foreseeable future, although now just marginally. The Trust Fund (as a share of GDP) would just touch zero in the years around 2080, but would then start to rise. We therefore have a choice. The Republican-passed budget framework has that an increase in the fiscal deficit of $1.5 trillion over the next decade is acceptable. It could be used for tax cuts that would accrue primarily to the rich. Or it could be used to ensure the Social Security system will be able, for the foreseeable future, to keep to its commitments to senior citizens, to their survivors, and to the disabled. The rate of return earned on what is paid into our Social Security accounts is actually quite good. It is especially good when one takes into account that these are investments in safe assets, and thus that the proper comparison should be to the returns on other safe assets, not risky ones. Yet critics of Social Security, mostly those who believe it should be shut down in its current form with some sort of savings plan invested through the financial markets (such as a 401(k) plan) substituted for it, often assert that the returns earned on the pension savings in Social Security are abysmally poor. These critics argue that by “privatizing” Social Security, that is by shifting to individual plans invested through the financial markets, returns would be much higher and that thus our Social Security pensions would be “rescued”. They assert that by privatizing Social Security investments, the system will be able to provide pensions that are either better than what we receive under the current system, or that similar pensions could be provided at lower contribution (Social Security tax) rates. There are a number of problems with this. They include that risks of poor financial returns (perhaps due, for example, to a financial collapse such as that suffered in 2008 in the last year of the Bush administration, when many Americans lost much or all of their retirement savings) would then be shifted on to individuals. Individuals are not in a good position to take on such risks. Individuals are also not financial professionals, nor normally in a good position to judge the competency of financial professionals who offer them services. They also often underestimate the impact of high and compounding fees in depleting their savings over time. For all these reasons, such an approach would serve as a bad substitute for the Social Security system such as we have now, which is designed to provide at least a minimum pension that people can rely on in their old age, with little risk. But there is also a more fundamental problem with this approach. It presumes that returns in the financial markets will in general be substantially higher than returns that one earns on what we pay into the Social Security system. This blog post will show that this is simply not true. The post looks at what the implicit rates of return are under several benchmark cases for individuals. We pay into Social Security over our life time, and then draw down Social Security pensions in our old age. The returns will vary for every individual, depending on their specific earnings profile (how much they earn in each year of their working career), their age, their marital situation, and other factors. Hence there will be over 300 million different cases, one for each of the over 300 million Americans who are either paying into Social Security or are enjoying a Social Security pension now. But by selecting a few benchmarks, and in particular extreme cases in the direction of where the returns will be relatively low, we can get a sense of the range of what the rates of return normally will be. The chart at the top of this post shows several such cases. The rest of this post will discuss each. The scenarios considered are all for an individual who is assumed to work from age 22 to age 65, who then retires at 66. The individual is assumed to have reached age 65 in 2013 (the most recent year for which we have all the data required for the calculations), and hence reached age 62 in 2010 and was born in 1948. The historical Social Security tax rates, the ceiling on wages subject to Social Security tax, the wage inflation factors used by Social Security to adjust for average wage growth, and the median earnings of workers by year, are all obtained from the comprehensive Annual Statistical Supplement to the Social Security Bulletin – 2014 (published April 2015). Information on the parameters needed to calculate what the Social Security pension payments will be are also presented in detail in this Statistical Supplement, or in a more easy-to-use form for the specific case of someone reaching age 62 in 2010 in this publication of the Social Security Administration. It is issued annually. The Social Security pension for an individual is calculated by first taking the average annual earnings (as adjusted for average wage growth) over the 35 years of highest such earnings in a person’s working career. For someone who always earned the median wage who reached age 62 in 2010, this would work out to $2,290 per month. The monthly pension (at full retirement age) would then be equal to 90% of the first $761, 32% of the earnings above this up to $4,586 per month, and then (if any is left, which would not be the case in this example of median earnings) 15% of the amount above $4,586. Note the progressivity in these rates of 90% for the initial earnings, then 32%, and finally 15% for the highest earnings. The monthly Social Security pension will then be the sum of these three components. Since it is then adjusted for future inflation (as measured by the CPI), we do not need to make any further adjustments to determine the future pension payments in real terms. The pensions will then be paid out from age 66 until the end of their life, which we take to be age 84, the current average life expectancy for someone who has reached the age of 65. The historical series of payments made into the Social Security system through Social Security taxes (for Social Security Old-Age pensions only, and so excluding the taxes for Disability insurance and for Medicare) are then calculated by multiplying earnings by the tax rate (currently 10.6%, including the shares paid by both worker and employer). The stream of payments are then put in terms of 2010 dollars using the historical CPI series from the Bureau of Labor Statistics. We can thus calculate the real rates of return on Social Security pensions under various scenarios. The first set of figures (lines A-1) in the chart above are for a worker whose earnings are equal to what median wages were throughout his or her working life. (A table with the specific numbers on the rates of return is provided at the bottom of this post, for those who prefer a numerical presentation.) The individual paid into the Social Security pension system when working, and will now draw a Social Security pension while in retirement. One can calculate the real rate of return on this stream of payments in and then payments out, and in such a scenario for a single worker earning median wages throughout his or her career who retired at age 66 in 2014, the real rate of return works out to be 2.9%. If the person is married, with a spouse receiving the standard spousal benefit, the real rate of return is 4.1%. Such rates of return are pretty good, especially on what should be seen as a safe asset (provided the politicians do not kill the system). Indeed, as discussed in an earlier post on this blog, the real rate of return (before taxes) on an investment in the S&P500 stock market index over the 50 year period 1962 to 2012, would have been just 2.9% per annum assuming fees on 401(k) type retirement accounts of 2.5% (which is typical once one aggregates the fees at all the various levels – see the discussion in section E.3 of this blog post). But investing in the stock market, even in a broad based index such as the S&P500, is risky due to the volatility. Retirement accounts in 401(k)’s are generally a mix of equity investments, fixed income securities (bonds of various maturities, CDs, and similar instruments), and cash. Based on the recent average mix seen in 401(k)’s, and for the same 50 year period of 1962 to 2012, the average real rate of return achieved after the fees typically charged on such accounts would only have been 1.2%. Social Security for a worker earning median wages is far better. As noted above, there is a degree of progressivity in the system, as higher income earners will receive only a smaller boost in their pension (at the 15% rate) from the higher end of their earnings. Thus the rates of return in Social Security for high income earners will be less. The rates of return they will earn are shown on lines A-2 of the chart. This extreme case is calculated for a worker who is assumed to have earned throughout his or her entire work life an amount equal to the maximum ceiling on wages subject to Social Security tax (which was $113,700 in 2013). Note also that anyone earning even more than this will have the same rates of return, as they will not be paying any more into the Social Security system (it is capped at the wage ceiling subject to tax) and hence also not withdrawing any more (or less) in pension. Such high income earners will nonetheless still see a positive real rate of return on their Social Security contributions, of 1.4% for a single earner and 2.8% if married receiving a spousal benefit. That is, while there is some progressivity in the Social Security system, it is not such that the returns turn negative. And the returns achieved are still better than what typical 401(k) retirement accounts earn. One should also take into account that high income earners are living longer than low income earners. Indeed, the increase in life expectancies have been substantial in the last 30 years for high income earners, but only modest for those in the bottom half of the earnings distribution. While I do not have data on what the life expectancies are for a person whose earnings have been at the absolute top of the Social Security wage ceiling over the course of their careers, for the purposes here it was assumed their life expectancy (for someone who has reached age 65) would be increased to age 90 from the age of 84 for the overall population. In such a scenario, the real rates of return for someone who paid into the Social Security system always at the wage ceiling over their entire life time and then drew a Social Security pension up to age 90 would be 2.2% if single and 3.4% if married with a standard spousal benefit. These are far better than typical 401(k) returns, and indeed are quite good in comparison to an investment in any safe asset (once one takes into account fees). The rates of return calculated so far have been based on what the actual historical Social Security tax rates have been, and what the current benefit formula would determine for future pensions. 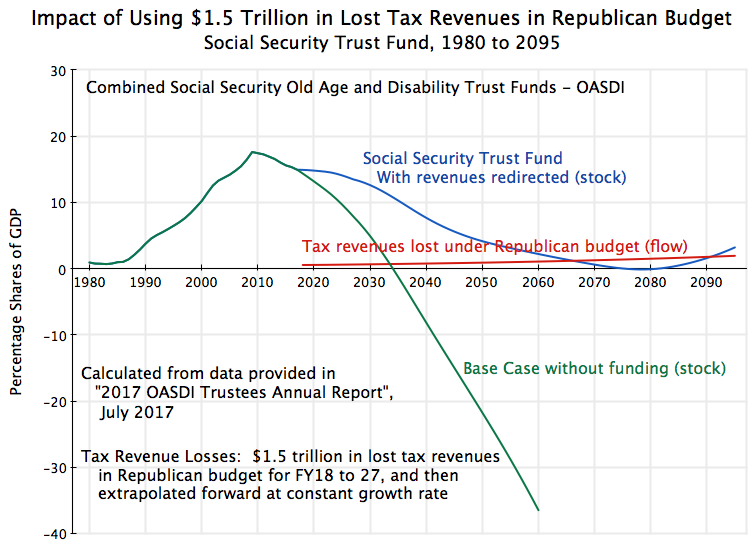 But as most know, at current tax and benefit rates the Social Security Trust Fund is projected to be depleted by about 2034 according to current estimates. The reason is that life expectancies are now longer (which is a good thing), but inadequate adjustments have been made in Social Security tax rates to allow for pay-outs which will now need to cover longer lifetimes. The problem has been gridlock in Washington, where an important faction of politicians opposed to Social Security are able to block any decision on how to pay for longer life expectancies. There are a number of ways to ensure Social Security could be adequately funded. One option, which I would recommend, would be simply to lift the ceiling on wages subject to Social Security tax (which was $113,700 in 2013, $118,500 in 2015, and will remain at $118,500 in 2016). As discussed in section E.2 of this earlier blog post, it turns out that this alone should suffice to ensure the Social Security Trust Fund remains adequate for the foreseeable future. The extra funding needed is an estimated 19.4% over what is collected now (based on calculations from an earlier post on this blog, but with data now a few years old), and it turns out that ending the wage ceiling would provide this. At the ceiling on wages subject to Social Security tax of $113,700 in 2013, the share of workers earning at this ceiling or more was just 6.1%, but due to the skewed distribution of income in favor of the rich, untaxed wages in excess of the ceiling accounted for 17.3% of all wages paid. That is, Social Security taxes were being paid on only 82.7% of all wages. If the taxes were instead paid on the full 100%, Social Security would be collecting 21% more (= 100.0 / 82.7). The extremely rich would then pay Social Security taxes at the same rate as most of the population, instead of something lower. It should also be noted that it is the increase in life expectancy of those at the upper end of the income distribution which is driving the Social Security system into deficit at the current tax rates, as they are the ones living longer while those in the lower part of the income distribution are not. Thus it is fair that those who will be drawing a Social Security pension for a longer period should be those who should be called on to pay more into the system. To be highly conservative, however, for the rate of return calculations being discussed here I have assumed that the general Social Security tax rate will be increased by 19.4% on all wages below the ceiling, while the ceiling remains where it has been. These calculations are for historical scenarios, where the purpose is to determine what the rates of return on payments into Social Security would have been had the tax rates been 19.4% higher on all, to provide for a fully funded system. 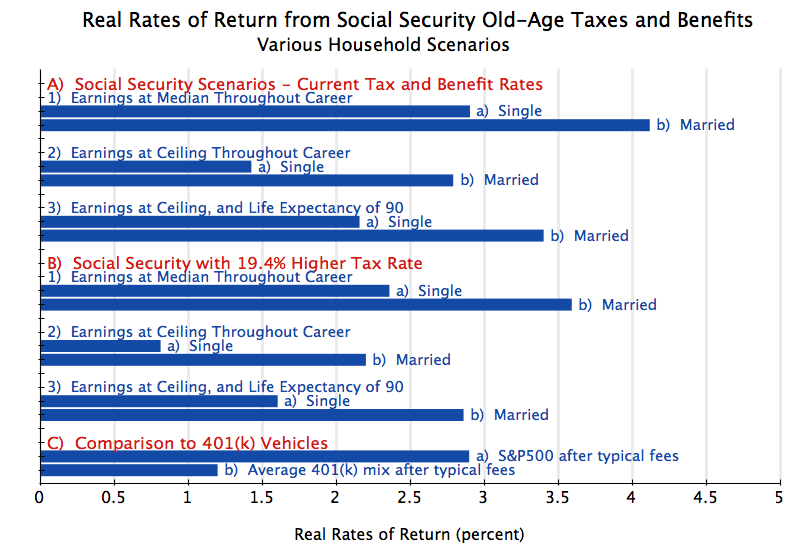 Finally, note that while these scenarios assume a higher Social Security tax rate historically, they also set the future pension benefits to be paid out to be the same as what they would be under the current benefit rates. That is, the pay-out formulae would need to be changed to leave benefits the same despite the higher taxes being paid into the system. The real rates of return would then be as shown in Panel B of the chart above. While somewhat less than before, the real returns are still substantial, and still normally better than what is earned in a typical 401(k) plan. The returns for someone earning at the median wage throughout their career will now be 2.4% if single and 3.6% if married (0.5% points less than before). The returns for someone earning at or above the ceiling for wages subject to Social Security taxes would now be earning at the real rate of 0.8% if single and 2.2% if married for the age 84 life expectancy (0.6% points less than before), or 1.6% and 2.9% (for single and married) if the life expectancy of such high earners is in fact age 90 (also 0.6% points less, before round-off). The real rates of return all remain positive, and generally good compared to what 401(k)’s typically earn. As noted above, the actual profile of Social Security taxes paid and pension received will vary by individual. No two cases will be exactly alike. But the calculations here indicate that for someone with median earnings, and still even in the extreme case of someone with very high earnings (where a degree of progressivity in the system will reduce the returns), the rates of return earned on what is paid into and then taken out of the Social Security system are actually quite good. They generally are better than what is earned in a typical 401(k) account (after fees), and indeed often better than what would earn in a pure equity investment of the S&P500 index (and without the risk and volatility of such an investment). Social Security is important and has become increasingly important. Due to the end of many traditional defined benefit pension plans, with a forced switch to 401(k) plans or indeed often to nothing at all from the employer, Social Security now accounts (for those aged 65 or older) for a disturbingly high share on the incomes of many of the aged. Specifically, Social Security now accounts for half or more of total income for two-thirds of all those age 65 or older, and accounts for 100% of their income for one-quarter of them. And for the bottom 40% of this population, Social Security accounted for 90% or more of their total income for three-quarters of them, and 100% of their income for over half of them. The problem is not in the Social Security system itself. It is highly efficient, with an expense ratio in 2014 of just 0.4% of benefits paid. Private 401(k) plans, with typical expenses of 2.5% of assets (not benefits) each year will have expenses over their life time that are 90 times as great as what Social Security costs to run. And as seen in this post, the return on individual Social Security accounts are quite good. The problem that Social Security faces is rather that with longer life expectancies (most importantly for those of higher income), the Social Security taxes being paid are no longer sufficient to cover the payouts to cover these longer lifetimes. They need to be adjusted. There are several options, and my recommendation would be to start by ending the ceiling on wages subject to Social Security taxes. This would suffice to solve the problem. But one could go further. As discussed in an earlier blog post (see Section E.2), not only should all wages be taxed equally, but one should extend this to taxing all forms of income equally (i.e. income from wealth as well as income from wages). If one did this, one could then either cut the Social Security tax rate sharply, or raise the Social Security benefits that could be paid, or (and most likely) some combination of each. But something needs to be done, or longer life spans will lead the Social Security Trust Fund to run out by around 2034. The earlier this is resolved the better, both to ensure less of a shock when the change is finally made (as it could then be phased in over time) and for equity reasons (as it is those paying in now who are not adequately funding the system for what they will eventually drawdown).